Turn your used books into food for seniors! 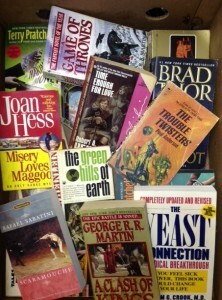 Grey Bears accepts your donated books and offers them on amazon.com. Click here to shop our Grey Bears book page! All proceeds from the program support the Brown Bag Program. Volunteers are needed to help with book research, data entry and order fulfillment at Grey Bears, 2710 Chanticleer Ave in Santa Cruz. We welcome all book donations at any of three County drop off locations: Grey Bears Main Campus, 2710 Chanticleer Ave (Mon-Sun, 7:30-3:45), Buena Vista Landfill Recycling Center (Mon-Sat, 7:30-3:30) or the Ben Lomond Transfer Station (Mon-Sat, 7:30-3:30). Not only will the books find new readers, they’ll support Grey Bears at the same time. We thank you for your literary support.